I’m so glad you liked them! While I am not an intuitive cook that can dream up recipes, I have a knack for finding good ones that other people create, LOL! Me too. I am not such an intuitive cook. I am a recipe collector. But once I get going I am pretty good at changing things up. There is a vegetarian oyster sauce available at Amazon…what can’t you get from there?? Weitai Vegetarian Mushroom “Oyster” Sauce 20 oz. $2.99 does not include shipping. Do you have a bottle? I don’t believe it is gluten free as the soy sauce is made from wheat… boo. But I can’t actually find the ingredients anywhere, so it is possible…. 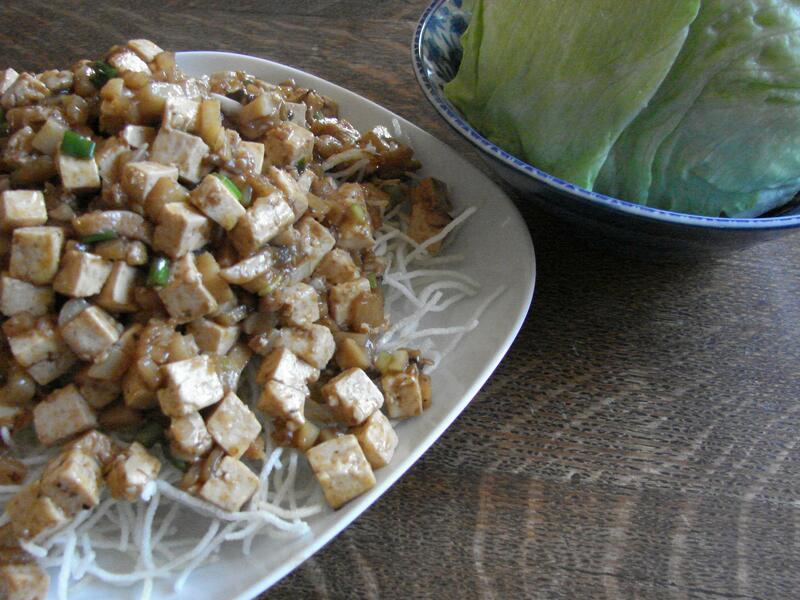 The soy sauce for their gluten free lettuce wraps does not have wheat in it. There are gluten free soy sauces. I believe La Choy brand is gluten free as well. Yes, I know their soy sauce is safe at PF Chang’s, as long as you order gluten free. And yes, there are gluten free soy sauces. LaChoy is one and San-J is another. As well, some people use Bragg’s Liquid Aminos as a soy sauce substitute. But finding a vegetarian, gluten free “oyster” sauce is my problem. You see, my husband is vegetarian and I am gluten free. There are non-vegetarian oyster sauces out there for me and non-gluten free oyster sauces for him, but none that are both. So when we go to PF Chang’s I can get the Chicken Lettuce Wraps but I can’t share them with him since he is a vegetarian. Nor can I eat the vegetarian lettuce wraps with him as they don’t make them gluten free, probably because they can’t find a veg and gf ‘oyster’ sauce! I’m allergic to shellfish and now just recently had to go gluten-free. It’s SO hard to find oyster sauce! Or nam prik pao sauce. Googling all morning hasn’t found an answer, but I did find your blog.